It’s a lovely set. Reasonably strong seats and solid frame that doesn’t blow around on windy days and nights. After one summer season, it’s maintained it’s color and weave, which is a relief. In hindsight though, I think it was overpriced compared to the very similar sets I saw for half the price in big box stores. 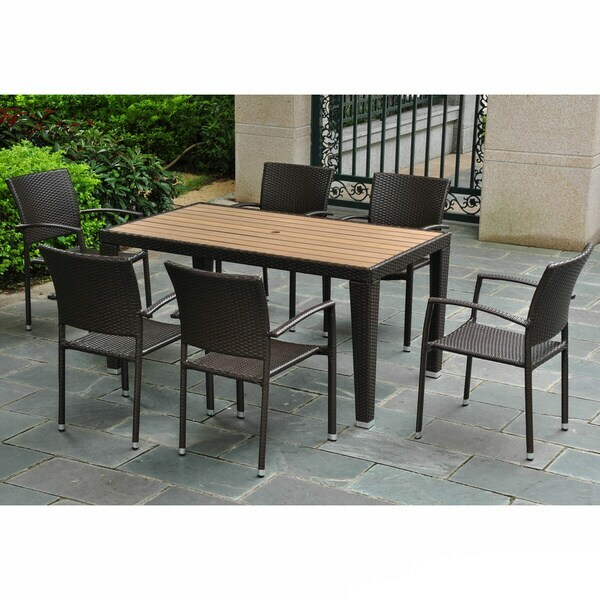 Gather friends and family around this sturdy and attractive seven-piece dining set designed for outdoor living. Offered in a choice of easy-to-accessorize neutral colors, this patio dining set features materials that withstand the elements, including resin wicker and polyresin. The rectangular faux wood table top accommodates an umbrella for shaded entertaining and meals. Minor Assembly Required for Table. This product ships in Two (2) boxes. I got compliments on this set, but I can't say that I truly love it. (In fairness, I'll admit I do have high standards.) The antique brown is actually textured and pretty rough on the skin. I got some overstock.com sunbrella cushions for the seats which helps to make it more comfortable, but still I'm worried about the back rubbing against our skin when all we have on are bathing suits. Also, the fake wood table top seems to absorb oils so that when food is spilled on it a mark is left that is hard to clean off. It is a good set for the money but just didn't blow me away. After striking out with steel patio furntiture (rusted on new patio within two weeks), I went searching for aluminum. The challenge was to find a nice-looking aluminum set that wasn't too expensive. I live in a northern state and only get so many months to use the furniture...not willing to spend thousands. I am very happy with this set, looks just as pictured, and after doing a lot of comparison shopping feel it's a good value. I will say that the table top (faux wood) is easily scratched. It arrived with several small scratches. While I didn't love that, it wasn't a deal-breaker for me. I've since added more scratches with a couple of dinner parties. So...if a scratch-less top is important to you, you may want to keep looking (it wasn't for me...and I'll probably start using tablecloths more regularly). Love my new patio set and it looks amazing on my deck but it was a HUGE pain to get set up. It came with the wrong legs so I wasn't able to put it together for almost two weeks until the new legs came. Then when I got them one of the legs was messed up and I had to go to a machine shop to get it fixed as I didn't want to wait any longer and had a deck party coming up. Once I was able to put it together though I've been very happy so far with this set and I received lots of compliments on it. The chairs are comfortable, lightweight and stackable and the table top is very easy to clean up. I also love being able to put a patio umbrella in the table which makes it! One other thing I'm dealing with is that the wicker on some of the chairs and on the table is already coming apart. I'm going to glue it down but it shouldn't already be doing that. For the money, I would recommend this patio set and this is the first time in 4 years that I've had a problem with anything from Overstock. Very nice set. I highly recommend it for price and quality. I like the table top in the synthetic wood. Very happy with this product. the color was true to the advertisement on the computer. it seems to be a good product. The set looked nice new, but did not wear well at all. The table has some sort of dye that immediately began seeping after a week or two outdoors: wiping it with a paper towel results in a brown mess. More significantly, however, the plastic faux wicker does not stand up to the sun at all. The set is now not yet four years old and is literally disintegrating--any pressure applied to the "wicker" causes it to crack. One can no longer sit in the chairs as they simply dissolve beneath you. Our set is now headed to the junk pile. The set may hold up fine out of direct sun, but if your patio/deck is exposed, and you plan to keep the set for more than a couple of years, look elsewhere. We wanted a rectangular set, not TOO large, stackable chairs, no cushions and an umbrella hole. This DEF met all those criteria. Bonus was that it was SUPER SIMPLE to put together and it looks great on our new pool patio. I am looking forward to seeing how well it holds up. THe woven wicker is very popular but it also makes me think after getting wet it could unravel. We shall see but overall we are Very happy! I like this set because it isn't real wicker so it is lower maintenance but it looks like it. It has held up really well even though it is very covered or brought inside. This set is weather resistant. "What is the seat height from the floor?" "What is the weight capacity of the chairs?" The chairs will support up to 275 pounds. "Do the chairs fit under the table?" Hello wallstreethippie, yes the chairs fit under the table. Thanks for shopping with us! A.S.
"I want to order the color in the first picture, the one with the dark table trim but lighter color table top (wood part) and darker chairs (matching table trim). What color is that?" I'd suggest asking online chat to confirm (I asked that exact question). I also wanted to dark chairs, lighter top and was told the darkest is chocolate, which I purchased. I was told that is not the color in the photo (can't remember the name they used for the one in the photo), but it sure is close! Sorry I can't be more specific, but wanted to suggest online chat help to confirm my thoughts. "What is the weight of the table? what is the weight of the chairs?" Hello paigejette, each chair weighs about 12lbs, the table is 62lbs. Thank you for shopping with us.